According to the current psychiatric definition, an hallucination is a ‘perception without an object’, a mental (or psychical) creation which has the appearance and authority of a perception, but does not refer to any reality verifiable by the senses. It intrudes into conscious life, and in the nineteenth century was seen as the typical symptom of madness. Its causes were subject to speculation: were they psychophysiological or purely psychical? For centuries, the phenomenon had been attributed to the power of the imagination and disturbances affecting it. In the vocabulary of classical antiquity, hallucinations had the nature of phantasmata, products of the imaginative power known as phantastikon. An object of study first of alienism, then of psychiatry in the nineteenth century, the hallucination preserved that link between phantasm and fantastic. The hallucinating madman was called visionary, because he saw things that other people didn’t. The term hallucination was applied retrospectively to the visions of the mystics in their state of ecstasy, such as those of the characters in the Christian story, in particular the hermit saints such as St. Anthony, or Christ himself, who had been subjected to temptation by the devil. Thus, a psychological (or, more precisely, psychophysiological) explanation was given to experiences traditionally attributed to the supernatural, and of which artists had provided countless more or less fantastical representations. This amounted to the naturalisation of the irrational. Thomas Carlyle (Sartor Resartus, 1831) spoke of ‘natural supernaturalism’. The hallucinatory vision was the ‘elsewhere’ of realism. The specific notion of artistic hallucination was put forward in 1866 by another author, Gustave Flaubert, responding to an enquiry from his friend Hippolyte Taine concerning the sources of the literary imagination. For Flaubert, the expression refers to the hold over the author’s mental activity when he is entirely absorbed in his work, when he sees his characters, when he hears them, when everything that he imagines, objects, landscape, setting, has assumed greater presence for him than his actual surroundings. In its pathological manifestations, hallucination has the nature of an alienating strangeness. It is suffering, terror. Because space is doubled, perception is disparate: one perceives both what is and what is not. In its artistic form, it is a total absorption, a beneficial alienation; it is joy, plenitude and ecstasy. This gap defines the breadth of the art of the imagination from the nineteenth century onwards and, more particularly, the ambivalent, tormented and ecstatic character of forms of the art termed “visionary” in the tradition begun by William Blake. The history of artistic hallucination corresponds to the age of the sciences and techniques of the psyche (psychiatry, experimental psychology and psychoanalysis). It also covers a vast field of experiences between terror and ecstasy. The imagination feeds on examples, it doesn’t emerge from the void. It is renewed through the life of forms, but also comes from the mechanisms of delirium nourished by artists’ biographies. These two processes are constantly intermingled. The transmission of cultural models and the apprenticeship in the ‘trade’ produce norms that artists contradict – and renew – by mobilising more or less eccentric resources of imagination and delirium. The history of artistic hallucination thus intersects with the discovery of the art of the insane, but is not reducible to it, insofar as it also concerns those who have never been subjected to psychiatric diagnosis. It is ambiguous, because it involves both perfectly established artists such as Picasso and the manifestations, which were for a long time kept marginal, of an art that Jean Dubuffet called ‘brut’ (or ‘anti-culturel’). In fact, this ambiguity is a constituent part of artistic hallucination. The chief developments in this history have to do either with specific experiences, sometimes marked by madness and time in the asylum, or with established trends and movements: Romanticism, Symbolism, Expressionism, Surrealism, psychedelia. But it is also necessary to overcome this alternative to identify what it is that constitutes a poetic of the imagination materialised in forms, in objects that are both specific and historic. Two British artists have, in different ways, embodied the eccentric posture of visionary and hallucinatory fantasy: William Blake (1757–1827) and Richard Dadd (1817–1886). The former laid claim to supernatural inspiration that was taken for delirium; the latter succumbed to delirium. But in both cases the hallucinatory vision emerged from an activity, and it produced works. One of the great painters of the past 50 years, the German Sigmar Polke, referred to these two artists. 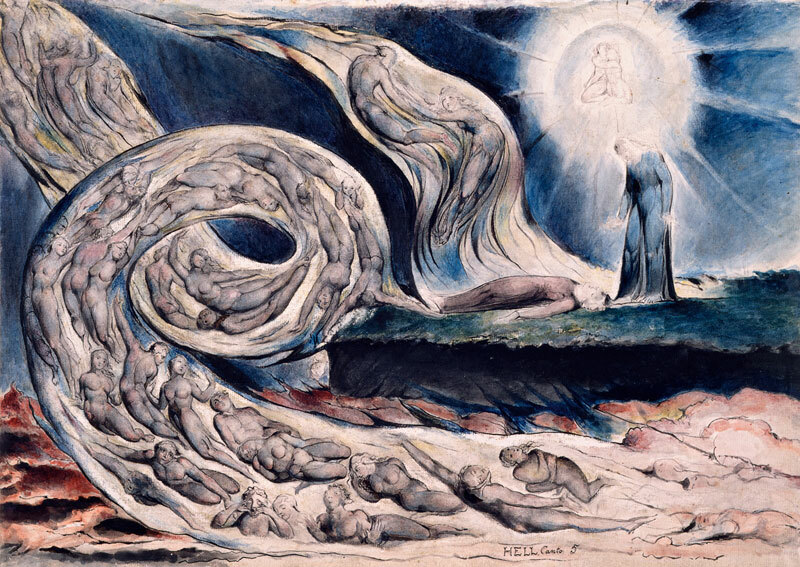 In the 1960s, when the norm of Pop and conceptual art had little to do with this kind of fantasy, he claimed, with (prudent) irony, to be in telepathic communication with Blake. Twenty years later he returned to the famous portrait that Blake had made of his demon-instructor: The Man Who Taught Blake Painting in his Dreams c.1819–20. In 1937 Joan Miró had drawn inspiration from this drawing to make a monumental self-portrait on canvas, irradiated, flamboyant (this adjective also refers literally to the vibrant, illuminated aura of the face). His self-portrait displayed the fundamental ambivalence of ecstatic vision, divided between terror and joy, which defines the artistic hallucination and condenses, as realism itself demands, the dramatic content of the present. From the 1980s until the major cycle shown in Venice in 2007, Polke unstintingly introduced and interpreted within the pictorial field hallucinatory effects mixed with quoted images in a collage form. Polke is the artist who combined and condensed the different directions taken by artistic hallucination, to the point of giving a veritable synthesis of them. 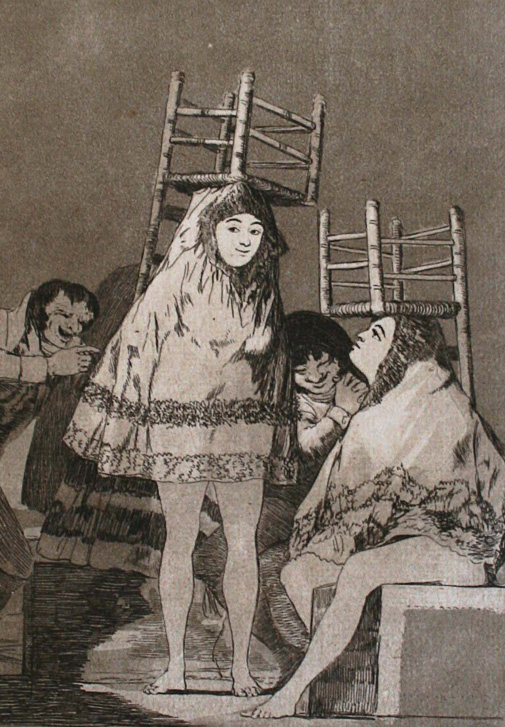 From the early 1980s onwards, he recovered the path of satirical supernaturalism opened up by Goya, Blake’s great contemporary. A painting from 1982, So sitzen Sie richtig (nach Goya und Max Ernst), links the vein of the fantastical grotesque with the Surrealist collage: the combined motifs are borrowed from an engraving by Goya and a collage from 1933’s Une semaine de bonté by Max Ernst. In the same year, two paintings, Magnetische Landschaft (Magnetic Landscape) and Die Schere (The Scissors), applied the Surrealist metaphor of the magnetic field to painting. During the 1960s and 1970s, Polke experimented with drugs and hallucinogenic mushrooms, particularly peyote and mescaline; beyond the psychedelic sphere of influence he joined up with two great artist-poets, Antonin Artaud and Henri Michaux, explorers of ‘paradis artificiels’ (Charles Baudelaire). In 1983 he made a large painting entitled Hallucinogen, constructed on the relationship between bands of violet, highlighted in white, and an earthy or cloudy ground. This violet was already present in the three Negativwert (Negative Value) paintings of 1982. A light-colour that occurs very rarely in nature, Goethe placed it among the ‘negative’ colours, with blue and green. It is also a threshold colour; the last one in the light spectrum, before the ultraviolet rays, which are invisible to the naked eye. 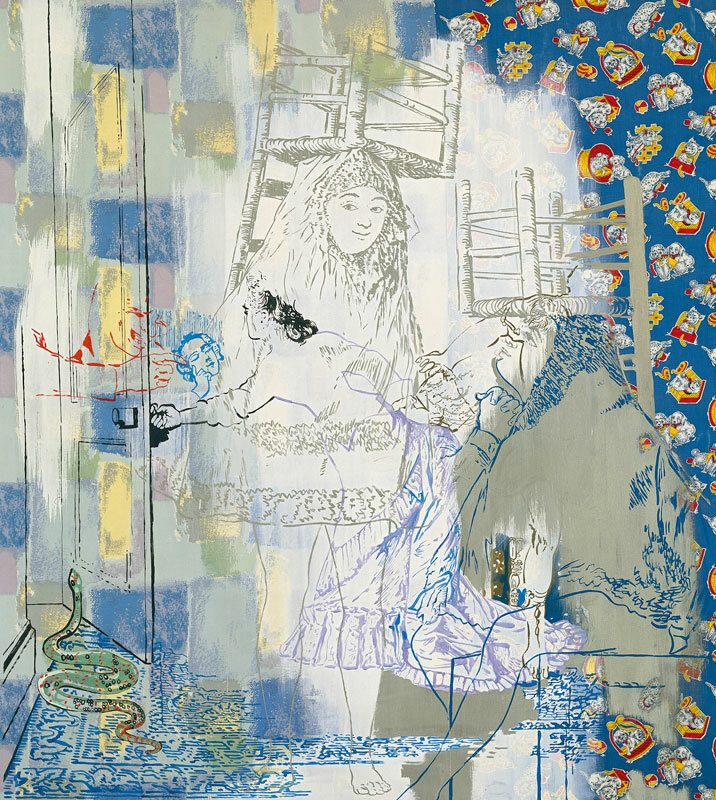 In introducing violet into the colour field of the painting, Polke was going to the boundaries of the visible. The visible and the invisible communicate as form and formlessness do. The pictorial field is thus the space, inaugurated by Turner, of a power of colour that is both irruptive and expansive. This is tuned to the hallucinatory experience of the voice which extends beyond the frontal frame of vision, because the voice can come from all directions, including the back of the body. One might be tempted to see Surrealism as an early accomplishment of the artistic hallucination (before the psychedelic movement); a kind of fusion of Rimbaudian clairvoyance, a reasoned occultism and the new tool of knowledge forged by Freud. To explain the change in his painting in 1925, Miró linked the reading of the poets (Arthur Rimbaud, Stéphane Mallarmé, among others) to the effect of hallucinations caused by hunger. In his famous Lettre du Voyant (Letter of the Seer, May 1871), Rimbaud had formulated the precept that governs the history of ‘voluntary’ hallucination (Baudelaire) when practised as a visionary technique: ‘The poet must make himself a seer by a long, immense and reasoned derangement of all the senses.’ The reasoned character of this method corresponds to the idea that the activity of the poet, or the artist, proceeds from a psycho-sensory technique as much as, and more than, from a skill, a ‘trade’; this technique mobilises all the senses – hearing and touch as much as sight. The hallucination, which can be auditory and tactile as well as visual, is consequently the vector, perhaps the ‘vehicle’ in the Buddhist sense of the word, of another, a completely other, reality, replacing the lived state of things as an alienating, unliveable status quo. Artaud thus set against the ‘lie of being’ the ‘truth of hallucination’, that is, the perfect elsewhere of realism: a world ruled by the pleasure principle and the hallucinatory satisfaction of desire. For him, any project of revolutionary transformation had to involve itself in that fundamental, radical revolt. In line with Surrealist orthodoxy, Max Ernst linked the techniques of his visionary method, collage and frottage, with the example of Rimbaud and Lautréamont, the author of the Chants de Maldoror (forgetting the direct precedent in the graphic work of Victor Hugo). In 1936 he published in Cahiers d’art an autobiographical text entitled ‘Au-delà de la peinture’ (‘Beyond Painting’), in which the two processes are defined in identical terms: collage and frottage act, he says, in the same way as hallucination; they produce a ‘sudden intensification of the visionary faculties’. In 1926 he had made a small manifesto-collage, using as his ground the title page of a book published the previous year, entitled Rêves et hallucinations (Dreams and Hallucinations). The collage satirically combines three areas: religion, war and fashion. At the centre there appears a quotation from Sartor Resartus by Carlyle, after Shakespeare’s The Tempest: ‘We are such stuff/As Dreams are made of, and our little life/ Is rounded with a sleep!’ The quote is blacked out by a cross. An arrow points underneath another, more trivial inscription taken from an advertisement for a strange brew: ‘The liver-friendly aperitif with French wines and extracts of artichoke’! Against the naturalisation of the supernatural, Ernst set the humour, the contrasts and the hallucinatory combinations of modern life. This was the route taken by the artists who emerged from the Dadaist revolt against the religious dogmas and elevated values of official culture. But the reference to supernaturalism (and to Shakespeare) remains legible beneath the crossings-out. 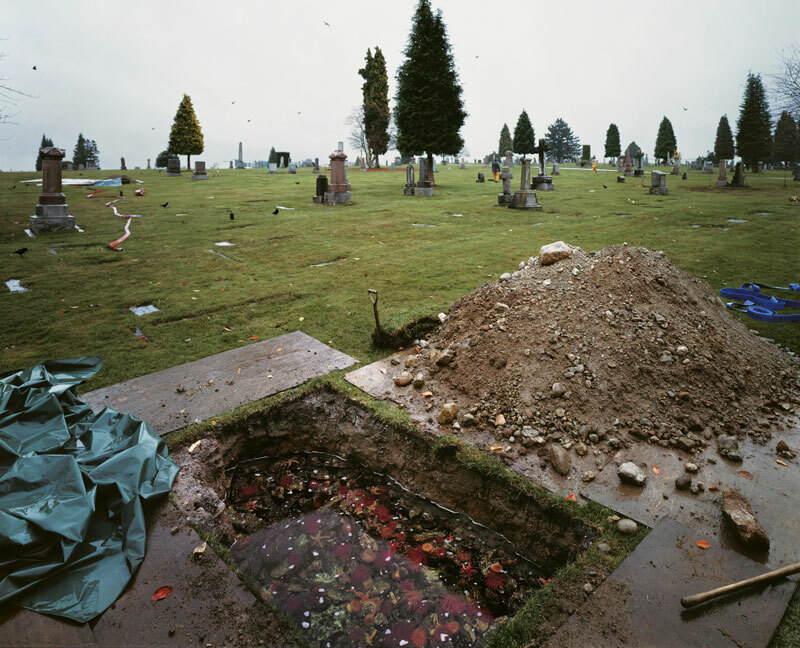 Jeff Wall’s picture The Flooded Grave 1998–2000 features the hallucination of a little bit of ocean in an open grave. The artist describes it as ‘a moment in a cemetery’; it links the fantasy of the aquatic tomb to the realism of a vision: ‘The viewer might imagine a walk on a rainy day. He or she stops before a flooded hole and gazes into it and for some reason imagines the ocean bottom. We see the instant of that fantasy, and in another instant it will be gone’ (Artforum, March 2001). Hallucinatory activity was and remains a component part of the Baudelairean programme of ‘painting of modern life’ adopted by Wall in the late 1970s. This programme cannot restrict itself to the objective, current data of sensory perception; it must integrate received images, found or hallucinated. The twofold nature, realistic and hallucinatory, of the environment described in The Flooded Grave arises out of a pictorial tradition that brought together a descriptive view and visionary apparition. The Surrealist painters adapted the formula to the modern conditions of ecstasy and illumination. The hallucinatory grip governs the contrasting psychological modes, between terror and joy, of metamorphosis. Dorothea Tanning, for example, introduces creatures in the process of metamorphosis into the ‘metaphysical’ space of Giorgio de Chirico. The Surrealist object, assembled, cobbled together, is not a sculpture, but an hallucination materialised and given concrete form. 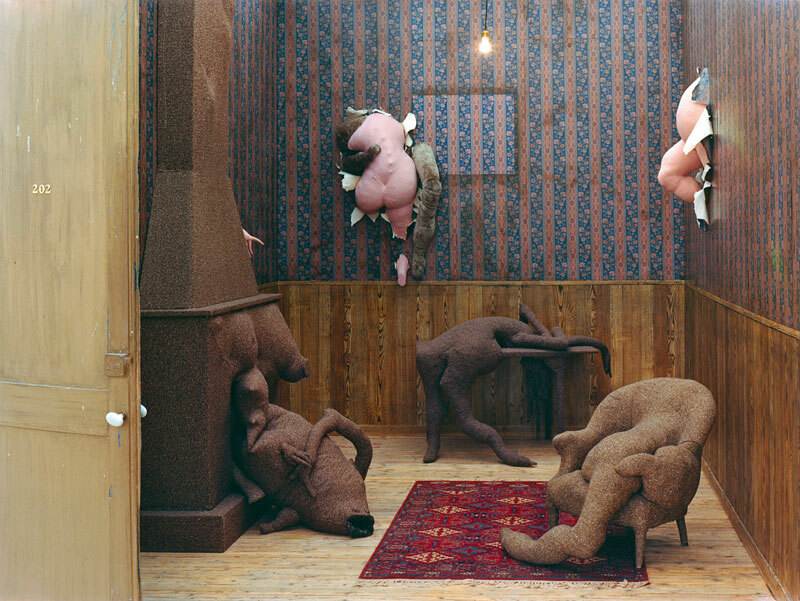 It is the elsewhere of realism permanently installed, in the defamiliarised domestic space. This experience of view (veduta) altered by vision characterises a large part of the art that emerged from Cubism and de Chirico. In the 1920s the critic Carl Einstein had noted the hallucinatory component of Cubism. The Surrealist collage (since Ernst) and then assemblage (since Kurt Schwitters) have heightened an effect of disparate juxtaposition that Flaubert had probably been first to notice in his 1866 description, when he wrote of the ‘hallucinatory’ painting: ‘It floats, it is suspended, it exists I don’t know where.’ This hybrid space, with borders as porous as the auditory space, in which objects float, is that of the two Interiors by Richard Hamilton, inspired by a found image (a still from Douglas Sirk’s film Shockproof). With its inserted cut-out figure, Interior II 1964 corresponds, down to the detail of the armchair, to Flaubert’s description. This interpretation of a film image is significant in itself, but this isn’t the place to develop the idea of how the cinema has contributed and continues to contribute to the poetics of hallucination. I shall suggest only that this contribution is not limited to the so-called experimental cinema that has emerged from Surrealism (since Un Chien Andalou), but also concerns the realist tradition, when ‘realism’ signifies the interruption of dramatic logic, the tearing of the narrative fabric. It was, in any case, an artist, the Californian Bruce Conner (1933–2008) who – since A MOVIE (1958) – transposed to cinema the hallucinatory process of collage, after making by means of assemblage objects haunted by the imagery of the Hollywood film. His graphic work presents analogies with Michaux’s mescaline-inspired drawings, but is distinguished from them by his greater formal rigour and a concentration of effects that recalls the best draughtsmen and engravers of the romantic phantastikon. The gothic imagery favoured by the mass media leads in his work to a new re-reading of Dante. Here, hallucinatory activity is closest to the concrete experience of the drawn. Like Hamilton (or Öyvind Fahlström), Conner demonstrates that the hallucinatory or visionary method, based on collage and assemblage, goes beyond the opposition between high and low culture. In the direction opened up by these artists, the currency of artistic hallucination is that of the works and plastic media that enable us to rediscover, in the teeming diversity of images, the irruptive and ecstatic quality of vision. 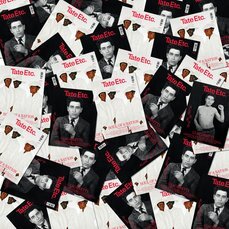 – You can see Blake’s work for free in Tracey Emin and William Blake in Focus, on view at Tate Liverpool until 3 September 2017, or on display at Tate Britain. – Jean-François Chevrier is professor at the École nationale supérieure des Beaux-Arts in Paris. His book Artistic Hallucination. From William Blake to Sigmar Polke is published by Paris: L’Arachnéen in French this autumn. – Translated from the French by Shaun Whiteside.